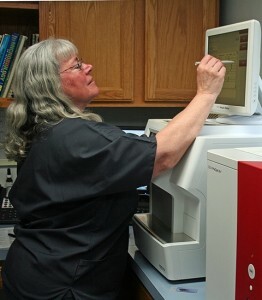 At Veazie Veterinary Clinic, we want to provide you with the most comprehensive diagnostic testing available. These services help us better understand your pet’s health. We are able to run a large variety of tests here in the hospital, for those times when knowing right away is the best option. For more involved or specialized diagnostics we work with laboratories and universities across the country. This enables us to run just about any test we can think of. Results from these tests are usually back within a few days, although some results can take up to 2 weeks or longer depending on the test being run. We can send images to a specialist and get a response often later that same day. Quick answers allow for prompt treatment in critical cases.